"Digital Composing as a Distributed, Emergent Process: Technology-Rich Spaces and Learning Ecologies"
Sheridan describes a technology-rich teaching and learning environment called the Language and Media Center (LMC), located in Michigan State University's Residential College in the Arts and Humanities (RCAH). 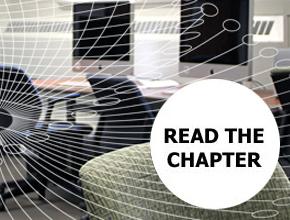 The chapter begins by summarizing current conversations on living–learning communities (LLCs), on learning spaces, on writing centers, and on networks and ecologies. Sheridan then shares the experiences of one RCAH student who visited the LMC as she worked on a series of related compositions. This student's experience, Sheridan argues, reveals a composing process distributed across a range of human and nonhuman agents. Tracing the activities of this student reveals the presence of a larger learning ecology, which the LMC participates in and helps to nurture. Note: Move through the chapter by clicking the buttons at the bottom of each page; use the TOC link in the top navigation bar to go directly to particular sections of the chapter.